Wish the article published today on New York Times was a fine piece of satirical humor. On the contrary, it contains the sad but true facts about our ignorance on nuclear energy, from top government officials to the average Joe. “Nothing, absolutely nothing has changed in 25 years,” Mr. Gurbuz said Monday during an interview, referring to the Turkish government’s response to the 1986 Chernobyl disaster, fallout from which hit Turkey’s Black Sea coast. According to a Greenpeace report published in 1996, Cahit Aral, the trade minister at the time of the Chernobyl meltdown, coaxed Turks to drink tea from the contaminated harvest, telling them that “a little radiation is good for you.” Mr. Aral, now 84, drank the tea on television to persuade compatriots to follow his example. 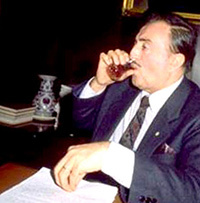 The then-prime minister, Turgut Ozal, proclaimed that “radioactive tea tastes better,” while Kenan Evren, then president, claimed radiation was good for the bones. Even without a nuclear reactor, Turkey in 1999 rated a level 3 incident on the International Nuclear and Radiological Event scale, classified as “serious,” when a container of highly radioactive Cobalt-60 turned up at an Istanbul junkyard, Mr. Gurbuz said.